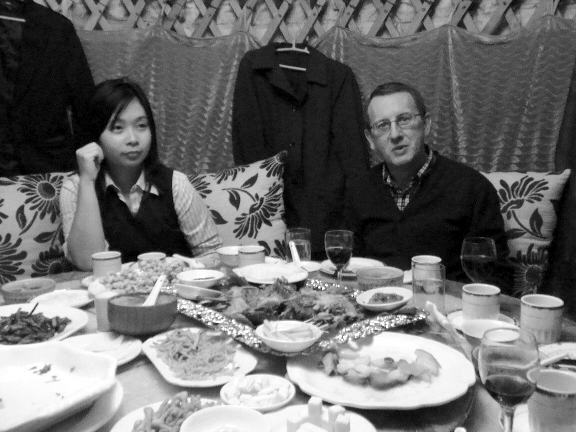 If you come to Beijing and want to experience a nice lamb dinner in a Mongolian tent (called yurt) – then go to the restaurant near Dongdan. We went there and had our own little yurt with our own waitress. Each yurt is a luxury tent as they have their own air conditioners. We did not order a full lamb, but really enjoyed the Lamb back. Later even some Mongolian singers came to sing for our guests from overseas. Afterwards we went to my favorite Chinese band called Second Hand Rose Band. In Chinese their name is 二手玫瑰. They played again in the Get Lucky bar. We arrived late but there were still 2 pre-bands playing. I was confused to see the Second Hand Rose lead singer with almost no hair and not wearing a dress nor high heal shoes. Also he was not able to put the typical rose into his hair anymore. I really always loved his outfit as well as the appearance and intensity on stage. That was missing today. This entry was posted on Freitag, Oktober 24th, 2008 at 23:58 and is filed under Beijing, Music. You can follow any responses to this entry through the RSS 2.0 feed. Both comments and pings are currently closed. There are two means of preventing carpets from getting dirty. Although many individuals prefer to clean the carpets around the home on their own, sometimes home-made recipes just can’t take away the stains and dirt develop completely.